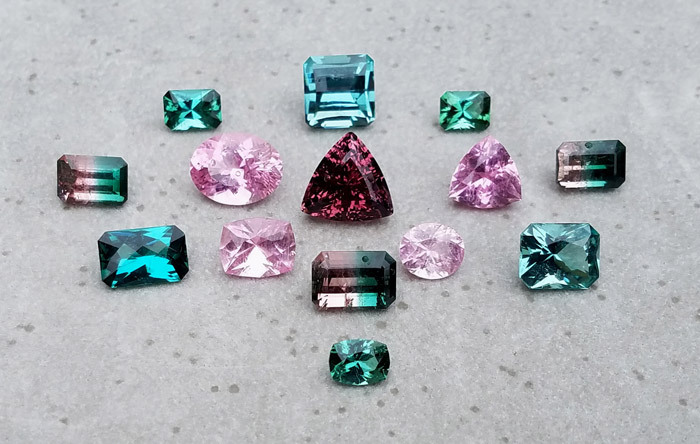 We are very pleased to announce that we are the exclusive dealer of new Maine Tourmalines from the world famous Mount Mica Tourmaline mine, located right here in Paris, Maine. We have a large selection of cut stones and jewelry in stock now and plan to increase it as well as offer some of the beautiful mineral specimens also being produced. In the late fall of 1821, two college students, Elijah Hamlin and Ezekiel Holmes were returning home from a mineral prospecting trek through the rolling terrain on the outskirts of Paris Hill in Oxford County Maine. Though the venture had been fruitless, the scenery was breathtaking and as the two young men turned to watch the sunset, a glint of green winked at them from the roots of an upturned tree. Upon investigating, they were amazed to find a stunningly beautiful crystal loose in the dirt. They hurriedly claimed it as the last of the suns rays disappeared behind the mountains and resolved to return the next day to look for more. That night, the first major snowstorm of the season blanketed the entire region that night with snow, postponing their search until Spring. After an endless winter, Spring finally arrived and as the woods finally cleared of snow, the two men rushed back to the spot. Returning to the uprooted tree, they began to search for more crystals and noticed an outcropping of ledge some distance beyond it. The sight that greeted them was the stuff of fairy tales: A rainbow had apparently splash landed on the rocks in front of them. Green and pink crystals of all sizes nestled in glittering cavities or lay loose on masses of sparkling white and purple minerals. The two spellbound students collected as many specimens as they could carry and staggered back to town where they displayed them to the villagers. The result was predictable, an anthill of activity as people flocked to the location and began searching for more of the lovely crystals. But what were the crystals? No one knew at first. 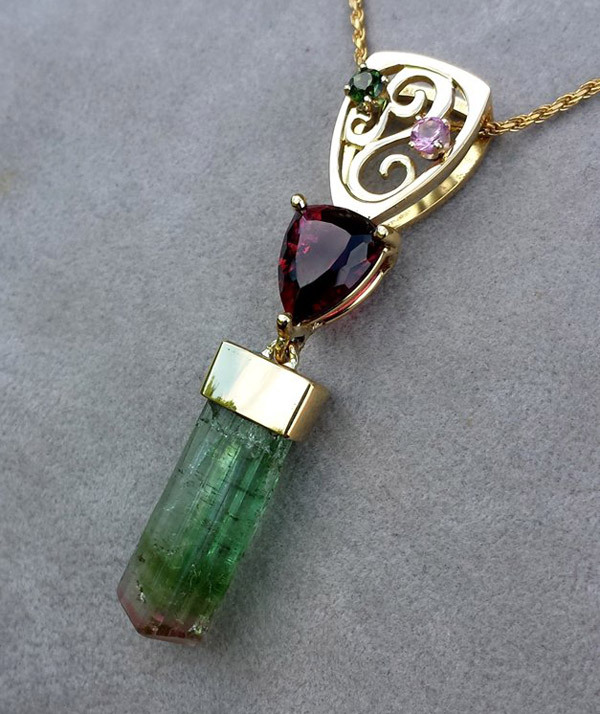 Finally, some samples were sent to Yale University where the mystery jewels were identified by Professor Silliman as the rare gemstone “Tourmaline”. Mount Mica (the name the locals had given the area) was the first source of Tourmaline in the United States and would become the first gem mine in America as well. Sporadic amateur mining continued for many years until 1868 when Elijah Hamlin and his son Augustus began a more serious mining venture. During their endeavor, many beautiful gem tourmalines were found. Tiffany and Co. of New York was a frequent customer, buying many gemstones and selling them through their Manhattan store. J.P. Morgan also purchased numerous crystals and made frequent donations to museums such as The American Museum of Natural History. 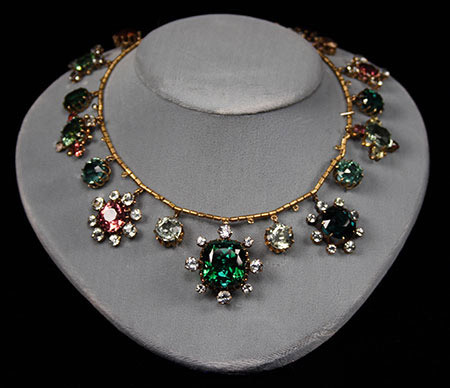 A selection of some of the finest of these gemstones found their way into Hamlin Necklace (pictured), one of the most famous pieces of American gemstone jewelry. 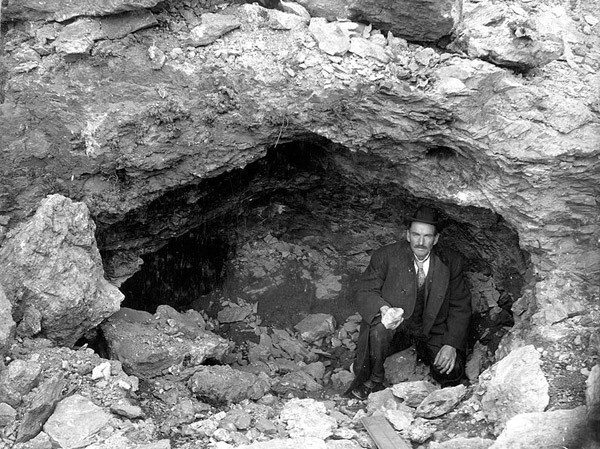 In 1890, Mount Mica was leased by Loren Merril (pictured, in a gem pocket). The next 23 years saw many wonderful tourmaline discoveries, including a crystal which was faceted into a 69.25 carat blue-green gemstone and sold to Tiffany's for $1000.00. Other fabulous finds included a pair of gem nodules (ultra-clear rounded crystal sections) weighing 411 carats and 302 carats as well as many smaller crystals. In 1926, Mount Mica was sold to Howard Irish of Buckfield. Though his success was not as great as Merril's, Irish did find nice material, including several thousand carats of lovely green Tourmaline. 1965 saw Mount Mica leased to Frank Perham.. Armed with more knowledge and experience, Perham had considerably more luck, adding to the list of significant Maine Tourmalines, a 25 carat emerald-cut gem and a stunning 59.59 carat heartshape gem as well as a host of smaller gems, all a beautiful blue-green color. Plumbago Mining Corp. of Rumford purchased Mount Mica in 1973 and began mining shortly thereafter. In 1978, a grapefruit sized pocket was uncovered. Within this tiny cavity, a mammoth crystal of green Tourmaline lay. It would later be cut into a flawless emerald-cut gemstone weighing 256 carats, a national record for Tourmaline. Mining resumed in 1990 and culminated with a trio of mint green nodules weighing 16 carats, 24 carats and 60 carats. In 2003, Mount Mica was purchased by Coromoto Minerals LLC. In August, mining began with the removal of overburden in the western portion of the mine. Immediately, pockets began to show and some beautiful quartz and apatite crystals were found in them. It wasn’t until 2004 however that the first tourmalines were found. 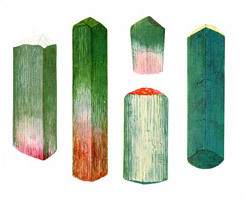 Seasoned with years of successful mining at other Maine localities and equipped with the best mining machinery, Coromoto began to uncover pocket after pocket, each containing wonderfully diverse colors of gem Tourmaline- some colors in fact, that had never before been found at this mine including electric pink and light greenish blue. In 2005, Coromoto began mining in a new direction and only went few dozen yards before they found the largest tourmaline pocket ever encountered at Mount Mica. The 2006 season continues the pocket bonanza. So far, 12 have been found, most containing gem tourmaline. Clearly, the Coromoto Era of Mount Mica will go down in history as one of the most productive. Coromoto Minerals LLC is owned and operated by Gary and Mary Freeman. Gary Freeman is an avid and competent gemstone miner who got his start as a child mining alluvial diamonds with his father in South America. Much later, Gary and Mary found their first piece of Maine beryl by accident while hiking a section of the Appalachian Trail in Andover, Maine and were hooked once and for all on Maine gemstones. Their first successful Maine mining venture took place at the Orchard Pit in Buckfield. There, they reopened an abandoned rock quarry and uncovered numerous pockets of gem golden beryls of a quality almost unheard of in America. One pocket contained orange beryl, a color never before seen in a Maine beryl. In addition to the newly purchased Mount Mica mine in Paris, Coromoto also owns mineral interests in Newry, Buckfield and Andover where they plan to eventually continue their passionate quest for Maine gemstones. Coromoto conducts their mining activities in an eco-friendly manner, setting aside wide tracts of land for non-development and wildlife habitat protection. For more information, visit them on the web at coromotominerals.com.